Captain Bernardo Herzer is a licensed ship captain and owner of a commercial research ship. 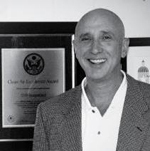 As an inventor and entrepreneur with a keen eye for creating and commercializing products/services within niche markets, Captain Herzer’s successes have gained him national recognition and a vast patent portfolio. Captain Herzer’s passion for raising environmental awareness is demonstrated through his sought-after presentations at green conferences nationwide. He is also deeply involved in engineering entrepreneurial and community connections and shares his entrepreneurial insights with students at UCLA, USC and Pepperdine University, as well as mentoring participants of the Founder Institute. Captain Herzer is the CEO and founder of LEHR, an environmentally friendly technologies company that is reducing our dependence on foreign oil by developing practical applications for his propane technology. He has personally been awarded the SEED Award for Environmental Leadership. LEHR has been awarded the prestigious Environmental Protection Agency (EPA) Clean Air Excellence Award for improving the nation’s air quality, Popular Science’s 100 Best Innovations of 2010, Popular Mechanics’ Breakthrough Product Award and many more.